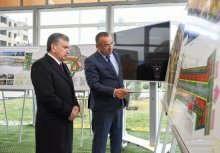 The President visited Mirzo Ulugbek makhalla in Jizzakh and got acquainted with projects on construction of houses, social facilities and landscaping activities in the city. Large-scale improvement activities, creating decent living conditions has been launched in Jizzakh. According to the city’s master plan, it is planned to erect five- and seven-story houses in Kimyogar, Ittifoq makhallas and on Mustakillik Street with shopping malls, clinics, hotels, makhalla centers. Objects are scheduled to be put into operation by 2022. There are ample opportunities, favorable natural conditions for tourism development in Jizzakh. It should be noted that the railway station forms the first impression of guests. In this regard, a cardinal reconstruction of the city railway station was carried out, all conditions are created here. Mirzo Ulugbek makhalla is located near the station, where large-scale creative activity is being carried out. In particular, seven-storey houses designed for 13 thousand 894 apartments are being built in the territory between the station and Tashkent street. A regional puppet theater with 250 seats will appear in Jizzakh. It is planned to be commissioned before the end of this year. More than 12.7 billion UZS were allocated for these purposes. The Head of the state was provided with information on plans for drinking water supply to residents of the region, improving the sewerage system of the city. The President noted that providing the population with clean drinking water is one of the most important issues. Instructions were given on performing the planned activities with high quality and on time. During the presentation, information was given on the upcoming work on greening the roadsides of the country, improving the roadside infrastructure. The Head of the state also visited Jizzakh Department of Internal Affairs No.3 and got acquainted with the execution of instructions given last year.